I’ve always liked this little thriller. It was made at an interesting time in terms of accessibility of celebrity, it was made at an interesting time for its stars, and it is a quirky left jab of a film. It’s been six years and two weeks since I’ve seen this movie – it was an early ranking in the infancy of johnlinkmovies – so I’m glad to get back at it. I watched PHONE BOOTH (2002) on 4.14.15. It was probably my fourth viewing of the film and first since April of 2009. 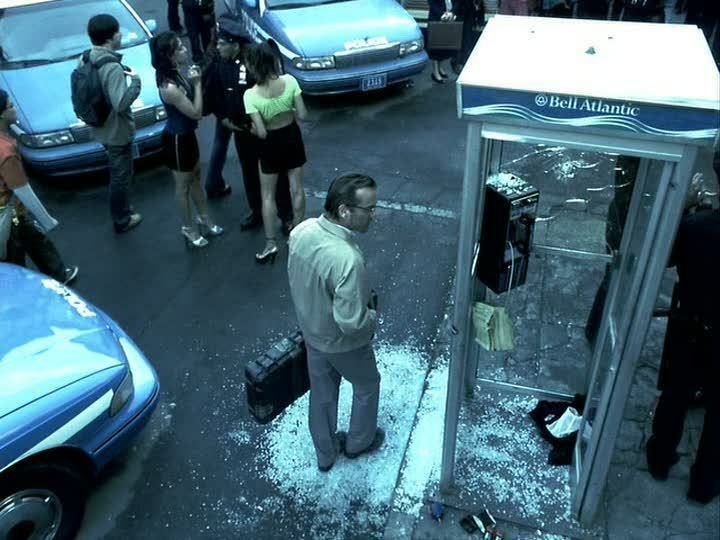 PHONE BOOTH doesn’t get the credit it deserves. With the advent of digital filmmaking, it is easy to make a single-location, low-budget thriller. Movies like BURIED or LOCKE owe a debt of gratitude to this early 21st century thriller which was considered revolutionary at the time. Today, PHONE BOOTH would have been made on a smaller scale and never seen a theater. But, being made when it was, Director Joel Schumacher is able to tell a simple story in simple terms. Stu (Colin Farrell) is a publicist who lies for al giving. We see a quick montage of him playing his clients, the media, and a restaurant owner. He’s a bit of a jerk, but never too much of a jerk. Quickly, he slips into a phone booth, takes off his wedding ring, and calls the young Pam (Katie Holmes – who was apparently just asked to keep playing Joey from Dawson’s Creek). After he hangs up, he quickly receives a call from a mysterious voice with a gun(Kiefer Sutherland) who threatens to tell Stu’s wife (Radha Mitchell) about his conversations with Pam. The matter escalates quickly, and soon a police chief (Forest Whitaker) shows up and it all becomes a full fledged negotiation. If there is a place this movie feels dated, it is in the fact that Stu is never allowed to be a terrible guy. The film is worried that he might be too unlikable if he’s flawed, so it hedges its bets with him. This could be, in one way, looked at as trying to make the viewer feel like any of they themselves could be Stu – if it happens to him, it could happen to me – only he’s got too eccentric a job and life to really invoke that sort of empathy. Instead, he’s just a mildly flawed victim who is guilty of being too flirty. The film’s script and direction should be taught in a Film Class in the unit on beats. There are definitive beats, or chapters, within the movie. As something is coming to a head, the score and the dialogue crescendo together before launching a new idea. Part of this is smart, and part of it is an unintentional byproduct of a new genre trying to figure out how to tell a story from a single location. The performances are better than the dialogue. Sutherland nails the voice-over (he replaced a fired Dennis Hopper after a day of shooting) and provides great weight, even if the voice always feels too disembodied for its own good. Farrell foretells of a solid leading man career in carrying the emotional weight of the movie. Mitchell and Holmes do all that’s asked. Whitaker is likable, though he is asked to carry the most contrived dialogue of the film. His police chief made a mistake in the past. If you don’t catch that the first time it’s mentioned, you’ll catch on by the fourth reference. It’s too generic to make us care, and too often referenced to be dismissed. His character is annoyingly conceived in the writing process. Though, again, Whitaker gives it more structure than it deserves. Ultimately, PHONE BOOTH is a quick and easy pleasure. The mistakes move by quickly enough to be forgotten. The acting works, the suspense is legitimate, and the ending feels genuine. So often these movies have become ABOUT the ending, rather than the ending serving the characters. Here, the journey itself is a good experience. ~ by johnlink00 on April 14, 2015. A neat premise that plays out pretty well. Hard to come by nowadays, really. Nice review John.